Orange reciprocal gradient: this is my first ever reciprocal gradient. I don’t know why I haven’t done one before now. 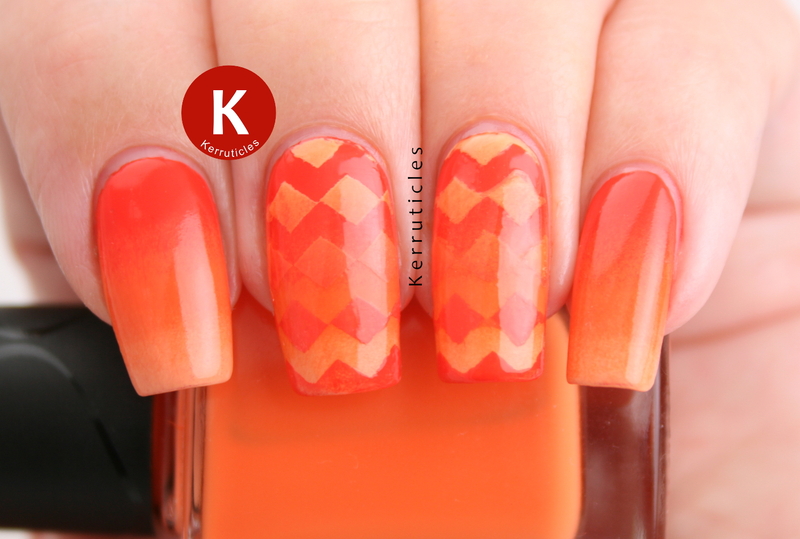 So, I’m glad therefore that it’s come up as my personal prompt for the orange theme in this week’s 40 Great Nail Art Ideas group. I added zigzags as the element to differentiate the two reversed gradients. After seeing a manicure by Caffeinated Cuticles (Jenn) on Instagram, I chose to “misalign” the zigzags nail vinyls so that they created little boxes, rather than zigzagged lines. I liked the way she’d done it, so copied it. I left two nails bare. I’m a lazy manicurist these days and rarely “accent” more than three nails per hand. It saves so much time. I usually do just the two centre nails and my thumbs. I did gradient the other nails though, as I thought it made it more interesting overall than a plain orange colour would have been. 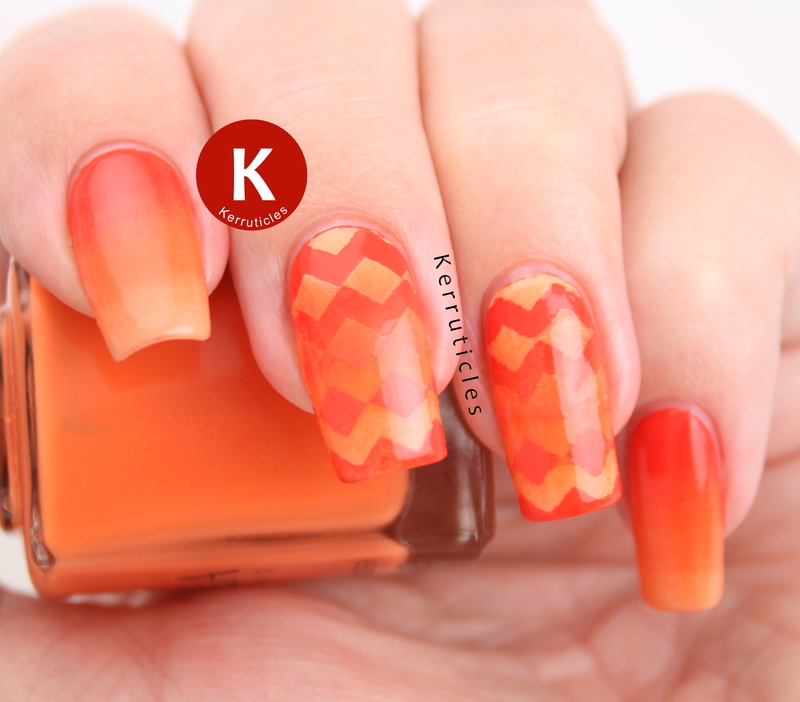 I used three orange nail polishes for the two gradients. Firstly, I used Barry M Full Throttle, a light, pastel orange as my palest colour. Then I chose Nella Milano Chilli Blaze, a medium orange. And finally, Nella Milano Cystal Coral. There’s nothing coral about it at all though; it’s a full-on red-orange. In hindsight, I think I should have mattified it, as the light reflections in the photos stop you being able to see the pattern so well. Next week the theme is “inspiration”. Who knows what I’ll be inspired by for that! At the moment I am completely clueless. The Nella Milano polishes used for this post were previously sent to me for review. All views expressed in this post are my own, honest and unbiased opinions.